Andrew is a PhD candidate in the Department of Ethnomusicology at UCLA with Daniel Neuman as his advisor. He is currently completing his dissertation on child-directed song practices in metropolitan India which focuses on urbanization, technology, and social change in relation to lullabies (loris) and childbirth songs (sohars). Andrew completed his dissertation research in Delhi, Kolkata, and Mumbai with the help of a Fulbright-Nehru fellowship in 2011-2012, living in Delhi with his wife and daughter. Andrew received his Bachelor of Music from the University of Colorado (2000) in viola performance and an MA in ethnomusicology from UCLA (2009). 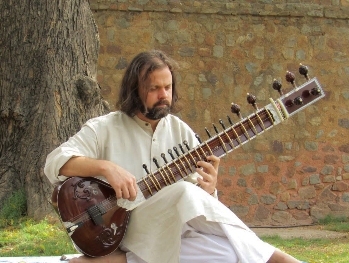 He has studied Hindustani classical music on the sitar for over 14 years, first under Roshan Jamal Bhartiya and most recently under Ustad Shujaat Khan.